As a business owner, you have a leadership role, whether you like it or not! In other words – know thyself. Leadership of others begins with leadership of self and knowing yourself. To help business owners “know themselves” and better understand others, Andy Buchanan-Hughes presents a fun and very enlightening session on why we ‘Click’ with some people and others drive us crazy. The tool and process that Andy will use, Alan Nelson and I have both used in our businesses with great effect. 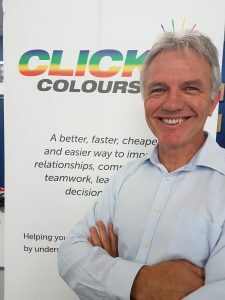 The Click Colours tool and workshops are used worldwide in leadership and team development. Andy has more than 40 years’ experience in sales and customer service, having held a number of management positions within various industry sectors. 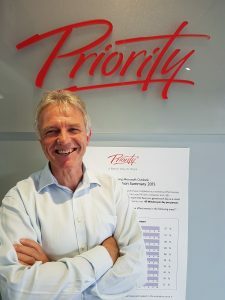 Over the past 14 years as Regional Manager at Priority Management in Western Australia, Andy has built strong relationships with the business sector which has led to exceptional growth and long-term business partnerships. Andy believes that business growth is down to providing excellent customer service by going above and beyond and doing what you say you’re going to do. Being a true connector of people by nature, Andy finds ways to bring together people of similar backgrounds and values to create new opportunities and strengthen existing and future business relationships. Developing powerful insights into human behaviour that boost both individual and team performance. This interactive workshop session will give you the tools and strategies that you can use immediately in your business. Business Owners Board (bob) is pleased to have Andy Buchanan-Hughes as one of its guest presenters. bob is a community of positive, like-minded business owners who form an advisory board of members who meet monthly to review the performance of their own business and assist others to develop theirs. It is restricted to the owners of the business only. At Business Owners Board we are building a community of passionate and motivated business owners and experts making a positive difference in the lives and businesses of fellow members through fellowship, advice and innovative solutions.